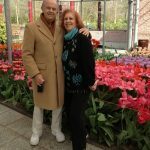 One of my early childhood memories is visiting my grandparents as they left for an around the world cruise on a Holland America Line cruise ship – this must have been sometime in the late 1970’s or early 1980’s. I remember being allowed to board the ship with my family and running through all the hallways and eventually ending up in a room where they told children to go. I remember what felt like thousands of people (probably just hundreds) lining the port watching the ship set sail. Many years later, Holland America Line approached me about taking one of their cruises and I immediately jumped at the opportunity. The cruising demographic has slowly become younger in the past decade. Perhaps cruising used to be associated with only the wealthy – demanding formal attire on board. 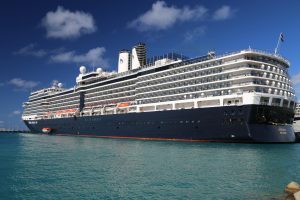 Holland America Line has adapted with the times and has creatively built a number of offerings that appeal to a wide range of ages. Cruising is no longer super expensive (especially if you look at shorter cruises in the 7-10 day range). 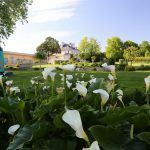 Their staterooms are reasonably priced and both on board and on shore activities have been diversified to appeal to a wide age range. In addition, wearing formal wear on board is no longer as strict as it used to be (during formal nights, parts of the ship do not require this). Three complete laps around the 3rd deck is equivalent to a mile of exercise. The ship is 936 feet long and nearly 106 feet wide, just slim enough to slink through the Panama Canal with something like 12 inches of clearance on both sides. 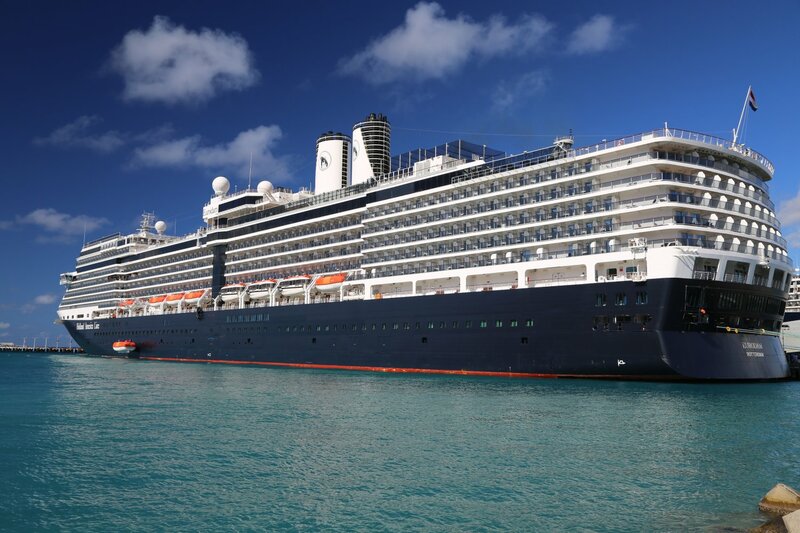 The ms euroDam is considered a mid-sized ship; it holds approximately 2,100 guests (there are much bigger ships approaching guest numbers in the range of 6,000) and 900+ crew on board. 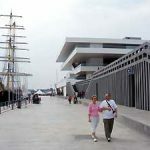 The ship was dedicated by H.M. Queen Beatrix of the Netherlands in July 2008. 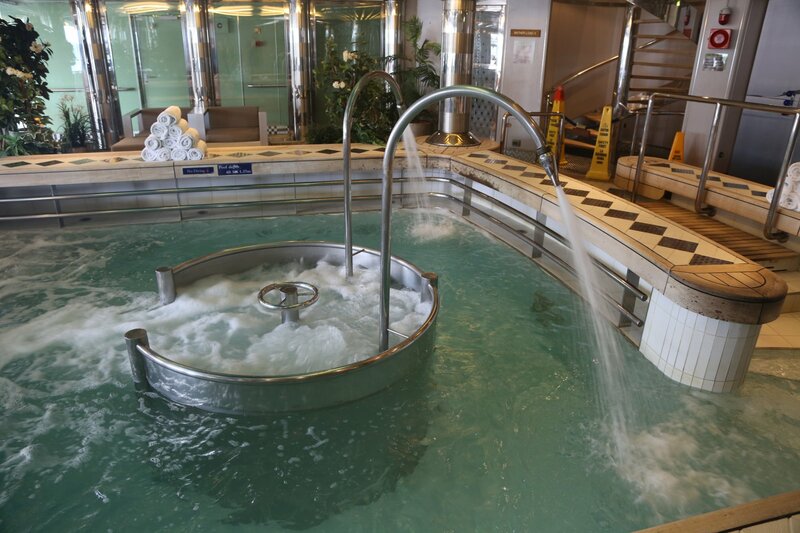 Five types of staterooms are offered all differing in size and placement on the ship. 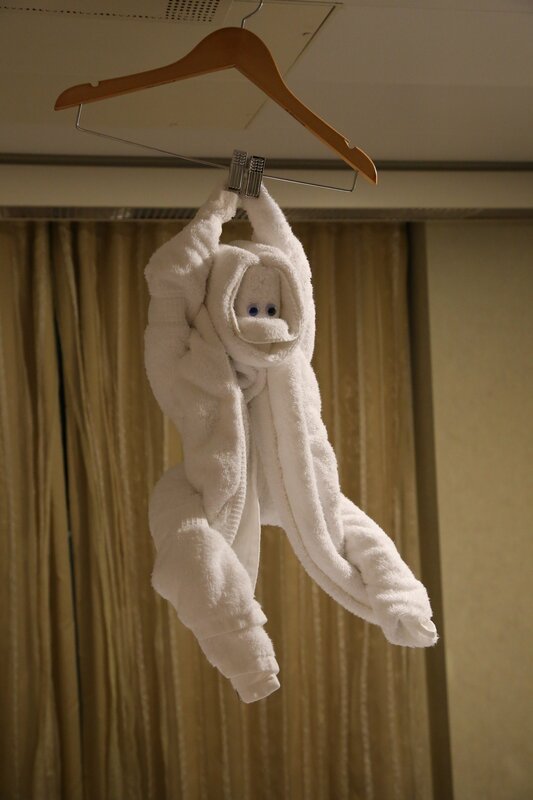 You are assigned staff for the duration of the cruise; they will look after your needs including in room dining, a turn-down and making sure the room and bathroom are kept clean. 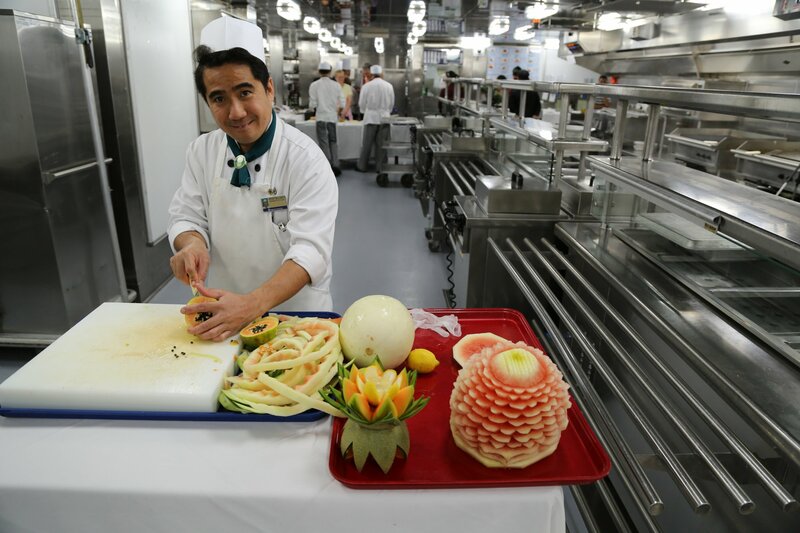 Cuisine is an integral part of a guest experience when on board – the kitchens and staff that supports the on-board culinary activities are impressive. The kitchen is separated into a number of ‘sub’ kitchens for certain parts of the meal and individual restaurants. The amount of items processed here during a normal week is astounding: 23,000+ eggs, nearly 12,000 pounds of meat products, 137,000 pounds of fresh vegetables and 450 bottles of wine! The ship recycles the hard products – the cardboard, metal and glass. With 5 main restaurants on board and a number of bars – one will not go hungry or thirsty. However, one needs to pace oneself to avoid becoming to gluttonous! 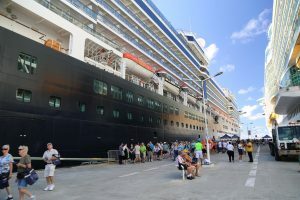 Any cruise that incorporates both a balance of days at sea (to participate in on board activities) combined with a number of port stops (off board activities) makes for a memorable experience. For those who have never cruised on a medium sized to large ship before – the on board activities can initially be overwhelming. One of the staff told us that this strong desire to participate in as many activities as possible can be classified as “FoMO” a fear of missing out. One has to carefully pick and choose what will be the most rewarding personal experiences. Where to start? The spa is probably the best place to begin when you board the ship – get your appointments taken care of and then head to one of the restaurants or bars on board. 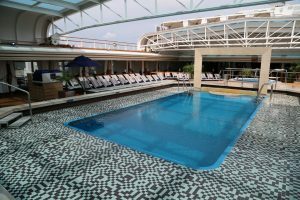 The main pools are located on the upper decks of the ship (one features a retractable roof) along with a fairly sizable gym, and steam room with whirlpools. More private cabanas are offered near the pool with views overlooking the ocean. If you desire exercise without using the gym, head down to Deck 3 which boasts the only round the ship outside walking area. Once around is equivalent to 1/3 of a mile. Classes, lectures and other activities are offered throughout the day including culinary events at the Culinary Stage, sponsored by Food and Wine Magazine (samples are given after the chefs create each dish). 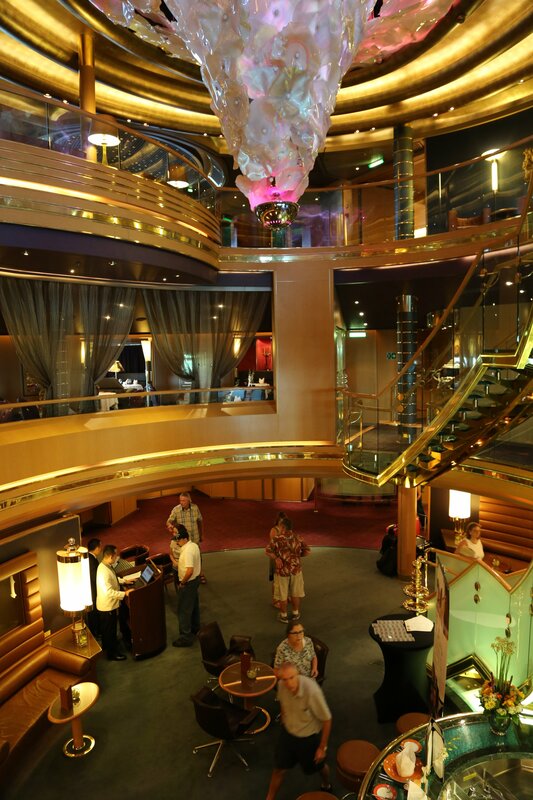 Performers are often brought onto the ship while in port – focusing on music, education and cultural activities. A cellar master is on board and offers Educational wine tasting seminars ranging from basic wine overviews and terminology to more advanced. Wines are presented from around the world – each one is analyzed and often paired with small bites. Talks about health related topics and evenings bring more fun – including live music especially at the BB King’s Blues Club. For those that have the stamina, a Pub Crawl is offered by appointment – visiting four of the bars on board with accompanying special drinking activities. The Digital Workshops are extremely popular with guests and are offered by Microsoft-trained technicians. The classes are geared more towards novice users with important information such as how to improve photo taking & editing skills, creating movies – and then how to share via a number of social media outlets. There are a number of pieces of artworks and other historical items located throughout the ship focusing on works by by Dutch masters and contemporary artists. Or if you are overwhelmed simply borrow a book from their library and relax in the comfort of your stateroom lost in a good read, taking some time every now and then to glance up and watch the ocean roll by. With multiple island stops and much of these days spent on land, the ms Eurodam provides a wide range of on shore activities ranging from very active excursions (snorkeling, hiking, diving (need to be certified), kayaking and zip-lining among others) to a number of narrated tours focusing on history and culture. 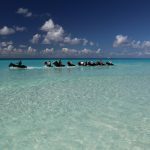 Several memorable tours including helicopter sightseeing above the island of Grand Turk in Turks & Caicos, a guided hike through El Yunque Rainforest in Puerto Rico, a visit to some of St. Martin’s stunning beaches or a guided hike starting on top of the islands highest hill or taking pleasure in riding a horse through the surf in the Bahamas followed by an adrenaline inducing trip through the lagoon and then into the open ocean on an Aqua Trax. Very good article, Dave. The early childhood days you mention in your article are gone – just good memories. Now cruise lines don’t allow visitors aboard because of the Middle East troubles and terrorist activity world-wide that forces extra security and protection for innocents trying to enjoy their lives and/or retirement travels. 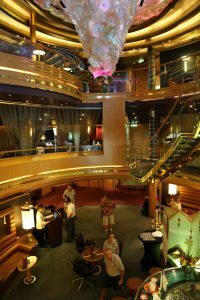 We loved a portion of Holland America’s World Cruise 3-years ago from Buenos Aires to Sydney. It was first class service and entertainment all the way for 32-days. Food was good too. 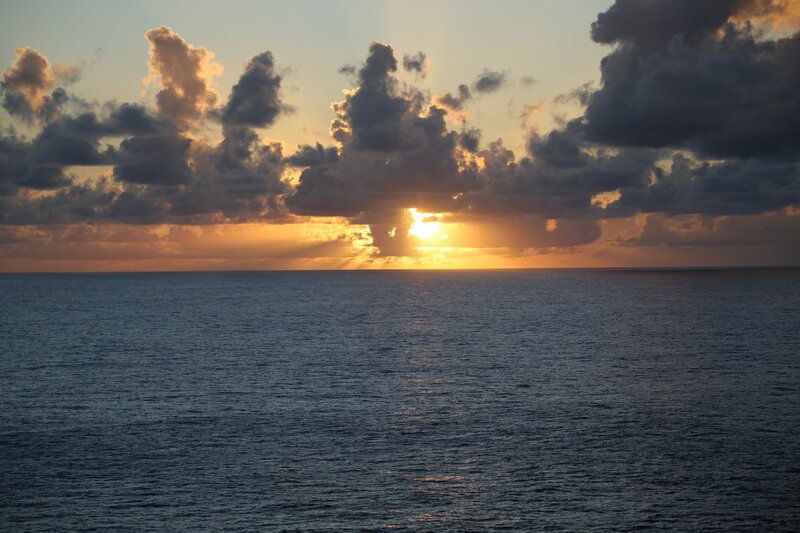 We recently took a cruise on Celebrity (September 2015). It was their New England/Canada Fall cruise from Cape Liberty, NJ. 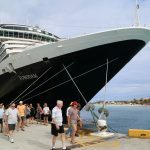 Yikes – – we were very disappointed with the cut backs in food, service and other amenities that we were used to aboard Holland America. Even Celebrity’s poorly trained staff – – many unfriendly made an unpleasant cruise. So, it’s back to Holland America for us. Michael – Buenos Aires to Sydney – that sounds like a good trek. I think I would prefer the shorter cruises – did 32 days seem to long? arrivederci. We’ve also enjoyed another 30-day cruise from Buenos Aires through the Panama Canal to Ft. Lauderdale. 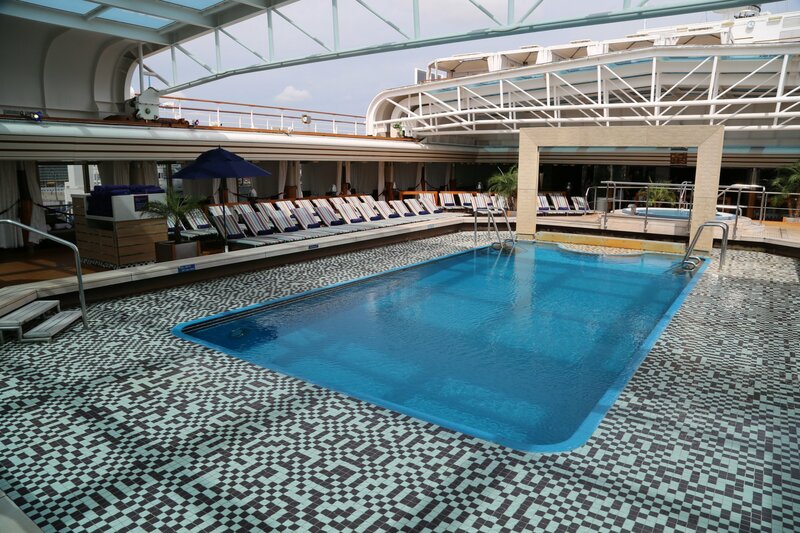 30-day cruises are the way to go for us. Retirement life is sweet.